The only thing that we like thinking about more than paper, might be envelopes. Paper Mart stocks thousands of standard and special size envelopes in our 200,000 sq. ft. warehouse facility. We offer a complete range of color and sizes along with the matching paper. In addition to offering a sizeable inventory, we consult with our customers and provide guidance in the development of custom envelope solutions. Over the past 40 years, Paper Mart has built a world class envelope printing operation that generates millions of high-quality impressions per day through our state of the art equipment. We offer 1-10 color printing to qualified customers, around the clock scheduling flexibility, and fast turnaround times. 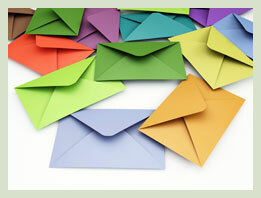 Paper Mart also offers Inventory Management Programs to customers that purchase printed envelopes. This allows us to successfully navigate through time-sensitive schedules in order to guarantee on-demand deliveries.